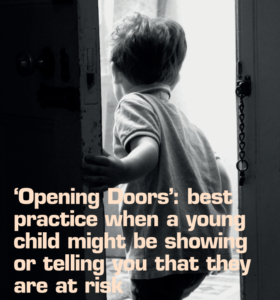 This article gives practical, evidence-based guidance on responding carefully to young children in early years settings, using an ‘open doors’ framework. The guidance is relevant for many situations, but particularly when you may be worried about a child’s safety. This article comes from the Early Years Educator journal and was written by; Ruth Marchant, a forensic interviewer and witness intermediary, providing communication support to very young children in their involvement with the police and the courts; and Lucy Turner, who works with Triangle as an intermediary, interviewer, advocate, and trainer. She is qualified as an Early Years Teacher and SENCO.